Unfortunately, due to the emotional nature of the September 11, 2001, attacks, a large number of Americans will undoubtedly buy into the latest Osama bin Laden video purporting to show the Evil One lavishing attention on alleged hijackers Wail al-Shehri and Hamza al-Ghamdi prior to their supposed martyrdom on American Airlines Flight 11 and United Airlines Flight 175 respectively. Never mind that Wail al-Shehri and his brother, Waleed al-Shehri, were both reported to have been found alive and well, according to the BBC. However, the intelligence patsy version of the al-Shehri brothers, according to the Washington Post and Arab News, disappeared after boasting of wanting to go off and fight the jihad in Chechnya in December, 2000. Hamza al-Ghamdi also did a funny disappearing act into Chechnya. Moreover, al-Ghamdi was linked to an address to a foreign military trainee housing unit on the Pensacola Naval Air Station in Florida, according to the Pensacola News Journal and the Washington Post, although this bit of revealing information has since found its way down the memory hole. Finally, the appearance of Mohammed Atef in the video is also very revealing. Atef was at one time a policeman in his native Egypt and a member of the group Egyptian Islamic Jihad, a group carved out of the Muslim Brotherhood, an organization long ago and notoriously compromised by MI6 and the CIA. It is said Atef died when a U.S. air-strike struck his home near Kabul during the U.S. invasion of Afghanistan on November 16, 2001. Dead men, of course, tell no tales, although their cameo appearances live on infamy. It is entirely possible this latest video is legitimate and not the standard intelligence bit of Light and Magic fakery of the sort that gave us the fat Bin Laden with his gold wedding ring, strictly forbidden according to Islam. Or rather, it is a legitimate CIA-ISI production, taped before the nine eleven attacks, as all the major players appearing on the tape have worked with the CIA, Pakistan’s ISI, and NATO, from Afghanistan to Bosnia and Chechnya. No doubt, as well, all concerned believed they were engaging in a sincere jihad against the Great Satan. But then, of course, such deluded creatures make the best patsies for false flag operations. Where was Osama on September 11, 2001? 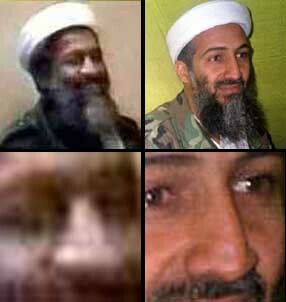 Osama Connected to 9/11? Not According to the F.B.I. More revelations emerge that Bush administration is protecting Osama Bin Laden.